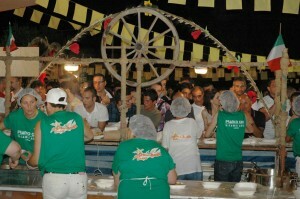 This event is one of the most well known and well established in the Salento region of Puglia. People come from far and wide to taste the delicious local dishes, watch and maybe take part in the dancing – including the tarantella – and listen to the local singers and bands, who perform every night. It’s the 21st edition of the festival and around 100,000 visitors are expected to attend, a far cry from its humble beginnings back in 1992. The fact that the name includes the word sagra means that this is, above all, a celebration of local food. In this case the star is the home-made, hand-rolled pasta called pizzitieddhri served in a tomato sauce. Pizzitieddhri is just one of a vast array of dishes available to try.